In essence, even a single photon or electron passing through a double-slit will display interference, collapsing upon any interacting measurement upon the initiating wave particle. In essence, any two (and possibly more) wave-particle ST units born of and thus assigned the same, equal but opposite quantum number state, i.e. spin angular momentum, will maintain and function as a single wave-particle system having a single quantum number state regardless of distance or time separation, in the absence of external negating influences. Transference is possible. If c, the speed of light, is fundamentally buit into the formation of ST itself — moving ƴ distance with each pulse-propagating ⱱ frequency — as described in LightspeedST — and as combined with MathspeedST, i.e. through the BIM informing that same ST pulse-propagating unit — all potential ST information, as to density and disposition of space per time, is inherently known! The BIM itself is defined as a Universal Relationship. Its numerical value of the quantity of parts (the value in each grid cell), in relation to its whole (the square values of the PD — that, by the way, directly inform the parts) is instantly and ubiquitously known for every value throughout BIM as extended to infinity. There is no propagation of information faster than c because all its information is simultaneously known. We thus have a basis for Quantum Entanglement: two or more particles born of the same quantum number state wholy remain connected regardless of distance of separation precisely because they are informed by the SAME BIM-derived ST pulse. 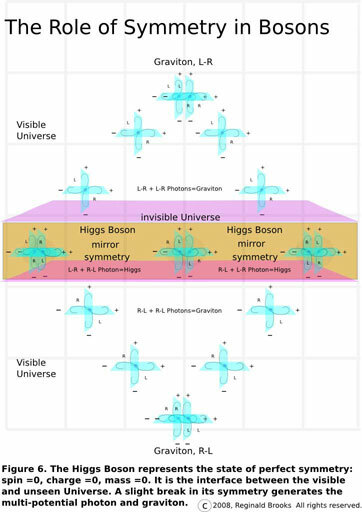 No information is exchanged — no violation of faster-than-light signals because both (all) particles have the SAME BIM information map informing their quantum state parameters at any and all ST unit pulses (ⱱ). The Quantum Entanglement example most referenced is that of spin, a vector momentum parameter. Two entangled particles (e.i., two photons or an electron-positron pair) are simultaneously born, each existing with both possible equal but opposite spin states. Upon any distance (or time) separation, determining the spin quantum state of one particle — collapsing its wave potential of both into that of one polemic — immediately determines the other as equal but opposite. The spin quantum state is a vector whose magnitude and expression is dependent on orientation (direction). So, for whatever context that vector exists within, a polemic is established, i.e., +/-, ↑/↓, yes/no, that inherently establishes a positive and negative state (Dirac Equation) — e.i., matter/anti-matter, +charge/-charge, spin+/spin-. The Quantum Entanglement State (QES) is just such a context — a container, if you will — holding the full potential of either/or vector states within its potential wave form. Measurement (Heisenberg Uncertainty Principle) —that is interacting with such potential state — necessarily collapses the potential wave-state into a definitive, particulate-like state — call it +/-, ↑/↓, yes/no, or Even/Odd. In effect, one has induced the vector state. In doing so, the other entangled member has its vector state induced to that equal, but opposite polemic value to its partner. Now, let the QES=BIM. Let collapsing the wave-potential (the entire BIM) = √BIM. Since BIM is built on squaring the 1,2,3… Axis numbers to give the PD — and all the Inner Grid cell values as its children — taking the √BIM is akin to collapsing BIM back to the equal and symmetrical opposite Axial numbers along the horizontal and vertical Axises. Alternatively, the BIM may indeed project into the imaginary number space, i, giving the equal but opposite value a more hidden meaning. Yet another alternative — and within the context of the current mathematical space the BIM occupies — one may induce the ubiquitous and infinity expanding Pythagorean Triples to provide the necessary polemical expression of a vector from the multi-potential of its wave-form. In this case — and exactly in tune with the BIM layout — there is a 90°-right angle relationship between the sides. In the BIM it is within a square, within the PTs it is within a rectangle (formed from the two orientations of the triangle). Both have a symmetry involved. The BIM has an absolute, bilateral mirror-reflection symmetry. The latter an algebraic symmetry in that various whole integer combinations of a2 + b2 =c2. In fact, there are, as we mentioned in the Intro (TPISC IV: Details), 4 geometric manifestations of each algebraically described PT. Two for each side of the bilaterally symmetric BIM, and two orientations (180° flips along the row/column). Perhaps the polemic we are looking for is simply the wave-collapse selection of one of the 4 possible orientations of the PT, with its opposite simply its mirror reflection on the other side of the BIM. The Quantum Entanglement Conjecture. Every PT has 4 potential presentations: each has a mirror symmetry, and because BIM has itself reflective, mirror bilateral symmetry, there are two more. Every PT has 4 potential presentations: each has a mirror symmetry, and because BIM is internally itself reflective, mirror bilateral symmetry, there are two more. For simplicity, the TPISC painting image (above figure) has been overlaid with three sets of PTs — each having 4 potential presentations. Exactly the same is true for the strictly Primitive PTs within the ToPPT. As ST formation is informed most certainly by the ISL (BIM), the PTs, and most especially the Primitive PTs within the ToPPT, are viable candidates for laying down a bit of slightly asymmetrical bilateral symmetry framework embedded within the perfect rotational and bilateral symmetry of the perfect squares and circles generated by the BIM. While the BIM itself is composed of alternating ODD and EVEN whole integer numbers, the PTs, especially the PPTs, pick these ODD and EVEN numbers out as part of their natural structure. Every PPT has one short side made of an ODD number and the other is always the opposite — an EVEN number. If one pictures the 4 potential presentations of the PT as existing as the wave-potential state of a forming particle, the naturally built-in polemics of these ubiquitous triangles comes into play: selecting to "measure" any one parameter as say, the spin ½ momentum vector, could collapse the wave function such that the other, opposite side of the polemic — which is always known as part of the Entangled Quantum State — could only express that opposite value. It could be something as simple as solving the Pythagorean Theorem. If you measure (solve) for one short side — an let's say it is an EVEN whole integer number — you instantaneously know the other side is ODD. You also can know its value if you know the hypotenuse. If you measure (solve) for one short side — an let's say it is an ODD whole integer number — you instantaneously know the other side is EVEN. You also can know its value if you know the hypotenuse. The geometry of ST formation generates descriptive parameters referred to as quantum numbers or their quantum number state — unique identifiers for each and every subatomic particle. These wave-particle ST units exhibit unusual and non-intuitive behaviors that reveal a connection to each other below the physical reality we observe. The Conjecture is that that underlying connection is the BIM and BIMtree geometry that informs the creation and disposition of ALL ST — including their quantum number state identifiers. In the simplest terms, the ST formation of the wave-particle pulse-propagates into and out of existence according to its energy. Each pulse expands form its own singularity outward via the BIM. The ST-BIM expands outward in all directions as a sphere, despite its forward motion as a vector. Thus it travels through both slits and interferes with itself on the other side. It is the BIM geometry information that is traveling through both slits, i.e. it doesn’t actually travel, rather it is known. If you block one of the slits or otherwise collapse the geometry wave by measuring or interacting with it, no interference occurs. It may be as simple as positive interference patterns may appear when the same Square/Circle WIN values of the BIM resonate and negative when they do not — giving the classical light-dark-light-dark pattern. Or, it may be the same resonance interference positive/negative superpositions for the PTs. As ST expands, a positive interference pattern would result when two (or more) 3-4-5 PPTs harmoniously arrive at the same ST location on the screen. The same for the 5-12-13, 8-15-17, etc. In either case, if you block one slit or collapse the expanding BIM geometry before entering the slit, interference will also collapse. A third, and perhaps more relevant possibility includes the interaction with the slit material itself. Remember, ALL ST pulse-propagates into and out of existence. All matter and all energy, including the material that the slits are made of, pulse. When only a single slit is open, the BIM geometry of the incoming wave-particle interacting with the slit ST does NOT generate an interference pattern. However, when two slits are open, the BIM-ST geometry of the slit material favorably interacts with the BIM-ST geometry of the wave-particle to generate interference! One cannot ignore the contribution of the slit BIM-ST geometry in forming the net pattern. Having more than a single wave-particle ST unit passing through the slit(s) is simply magnifying the fundamental interaction between the slit material and wave-particle BIM-ST geometries! As Heisenberg so profoundly pointed out, all contributions to any observation-measurement scenario must be accounted for. Together, the Double-Slit Experiment and Quantum Entanglement Conjecture (DSEQEC) are but two sides of the same coin. Details to follow in TPISC IV and V.
The absolut key notion in the DSEQEC is that the geometry of the BIM and BIMtree both simultaneously and automatically precede and inform the subsequent ST unit expression, and, that this geometry is ubiquitous — expanding to infinity! The ER = EPR conjecture is a very interesting insight into the joining of quantum mechanics with quantum gravity through the geometry of spacetime. ST itself, and thus it ST progeny, must be fully accountable for all intricacies of the Double-Slit Experiment. Key to the ordered formation of ST is the ISL. 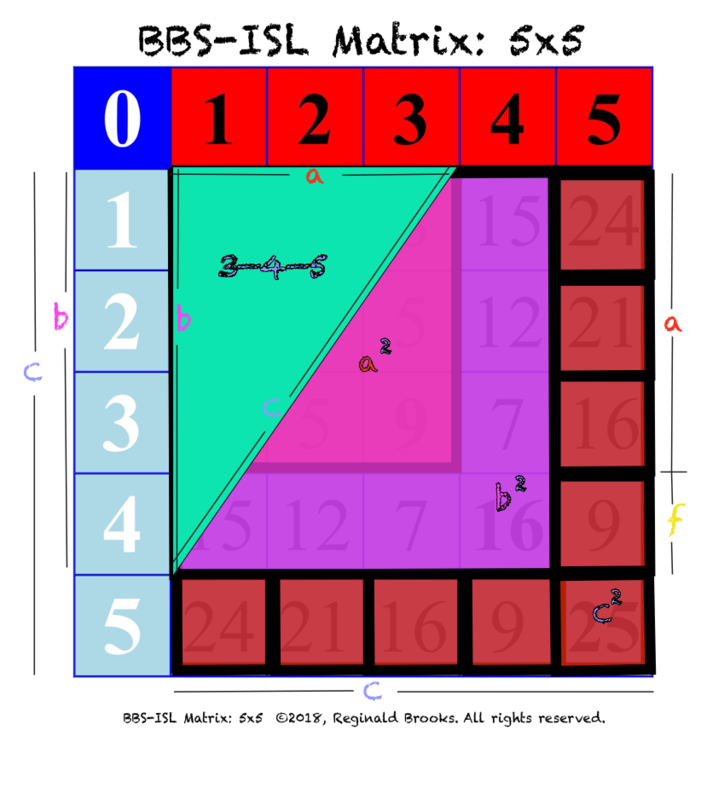 A fully, self-consistent matrix grid array numerically depicting the ISL in all its glory is easily formed by filling in all the Inner Grid cell values as the difference between squares of the x- and y-axis whole integer numbers (MathspeedST). 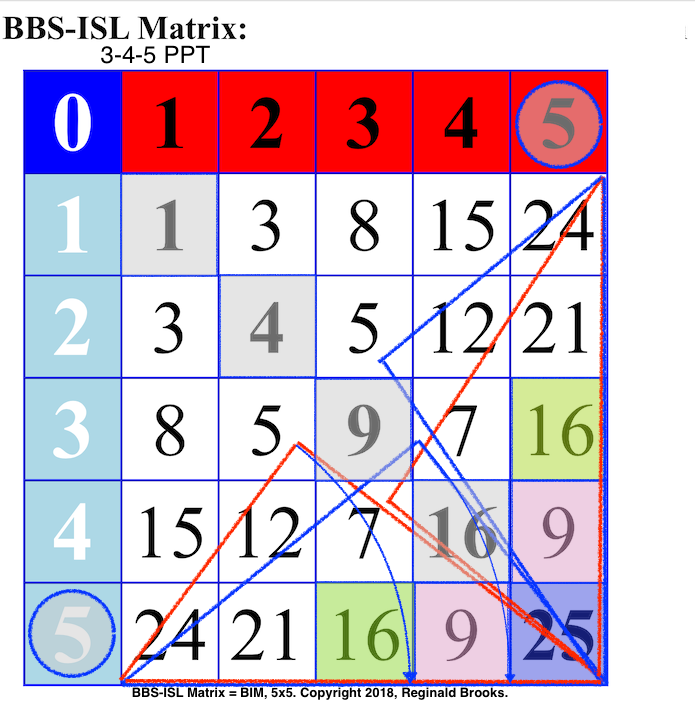 It’s called the BIM, or BBS-ISL Matrix. 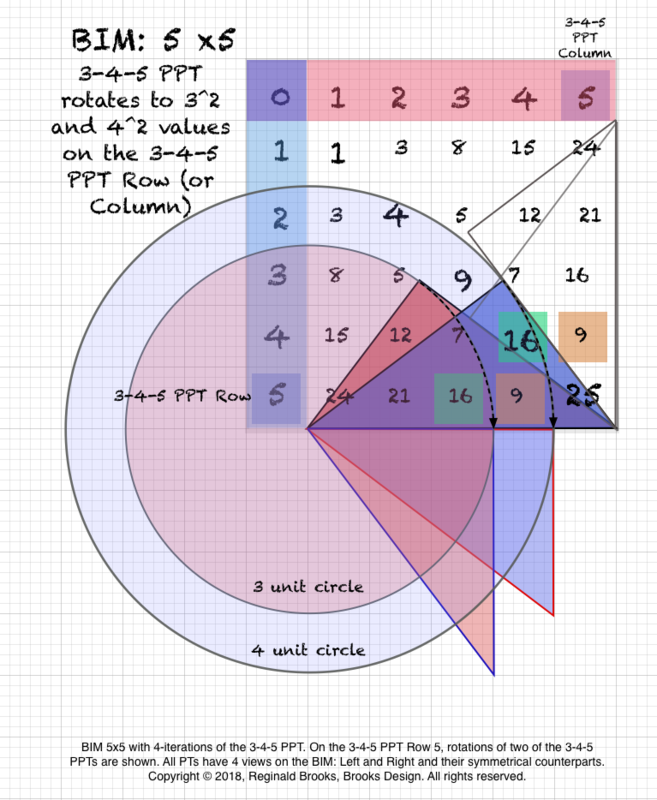 The PRIME numbers — PRIMES — as laid out on the BIM. The BIM is the FIXED GRID numerical array of the ISL. The PTs are the Pythagorean Triples, and more specifically, the PPTs are the Primitive Pythagorean Triples (parent, non-reproducible). All PTs — primitive and non-primitive — are found on the BIM ([TPISC I: Basics, TPISC II: Advanced, TPISC III: Clarity [Tree of Primitive Pythagorean Triples, ToPPT], and TPISC IV: Details](http://www.brooksdesign-ps.net/Reginald_Brooks/Code/Html/MSST/MSST-TPISC_resources/MSST-TPISC_resources.html)). Amongst its vast array of inter-connecting Number Pattern Sequences (NPS) — i.e., number systems — two such systems stick out and do so in such an overtly visual — as well as mathematical — way that their connection to each other is more than implied. You see, both the PPTs and PRIMES strictly align themselves on the SAME paths within the BIM. But we are not here to discuss the PRIMES, just the BIM and the PPTs. And why is that? How do they shed light on the Double-Slit Experiment, Quantum Entanglement and the whole Geometry of Spacetime scenario that, I believe, underlies ER = EPR? Briefly — very briefly — the PTs introduce rectangles, ovals and non-isosceles right triangles as articulation nodes within the architectural framework of the pure squares, circles and isosceles triangles that the pure ISL builds, as clearly revealed — through a highly visible algebraic geometry — on the BIM. Visually, right on the BIM grid, one can see — literally draw — the PTs on each active Row (or Column since the BIM is bilaterally symmetric). Now, two point of emphasis before carrying on: both the BIM and the embedded PTs are fixed, non-variable mathematical entities, and, they both extend to infinity. Every ST unit pulse is informed by this grid information at the start (from its S), and is known throughout its pulse-propagation history. It is “information” that exists with no need to travel at or faster than the speed of light. If one knows “any” value and location on the grid one inherently knows “all” the information that defines that history. Not only that, but the BIM and PTs are so intimately linked throughout the grid that one can be used to define the other. Because the BIM is bilaterally symmetrical, and, because every PT can be inherently represented on the BIM in both “left” and “right” hand depictions — e.i. on an active Row, a 3-4-5 PPT can be depicted equally with the hypotenuse along the axis Row (lower left BIM) and its short side to the “left” and to the “right” and if you turn to the Columns side of the BIM (upper right), again the “left” and “right” versions of the same 3-4-5 PPT are depicted. What is even more amazing, the Area of the PPT x 4 is always present on that same Row (or Column) and is integral to defining the relationships to the next PPT within the ToPPTs. There is so much inter-connectedness between the BIM, the PTs and the next PPTs built right in to the grid that one feels a blue-print for the fractal-based holographic ST universe is right before one’s eyes! Back to the point: let the 4 iterations of the PT — any PT — structurally represent the quantum state parameter of spin (spin angular momentum). When one measures the vector spin value and orientation, one is measuring one of the 4 PT iterations. Knowing one value, one always instantaneously knows the value of the “other” entangled ST unit coherently existing as part of a complementary pair sharing the same total quantum state. If your axis of measurement defines “left” (or -) on one ST unit moving in one direction, you will automatically register the equal but opposite “right” (or +) measurement on the other entangled ST unit moving in the opposite direction. No information is transmitted or signaled. It is inherently known and the very process of which axis is used to make the measurement pre-selects the two opposite spin orientations. Sorry, but the hidden information is neither hidden nor transferred at faster than lightspeed — it is simply known! This is the Quantum Entanglement Conjecture. The Double-Slit Experiment Conjecture suggests that the very same known information is what is ultimately revealed on the screen as an interference pattern of even a single photon. It appears that the photon splits itself into two (or more) parts, each going through one of the double-slits and thereafter re-combining as positive and negative interference patterns, and while I do believe this is very possibly part of the story here, what is really being exposed — most emphatically not transferred — is the known information of the BIM/ISL as the collapse of the all possible wave probabilities of a given photon traveling through one or the other of the two slits. Information can demonstrate positive and negative interference! Together, the Double-Slit Experiment Conjecture and the Quantum Entanglement Conjecture are the result of the one and same information expression: DSEC = QEC, or DSEQEC for short (Double-Slit Experiment Quantum Entanglement Conjecture). The information briefly presented here is freely available in its full form on my website and is included in several of my free iBooks. A few of the more advanced iBooks have a nominal charge, but I have free redeemable coupons available upon request for teachers, educators and students. NOTE: The decoupling of strict symmetry of the Higgs Boson generates mass expression in forming ST units with mass, i.e. fermions, baryons and mass+ bosons. NOTE: Every PT is on the BIM, along with its proof. In addition, the Axis Row containing the PT always contains the squared value of its sides and hypotenuse, as well as its Area value x 4. NOTE: Every PT is represented on the BIM 4x, a "left" and "right" version on both the Axis Row and its symmetrical Axis Column. The ramifications of Susskind, Maldacena and Van Raamsdonk's works are most profound, offering a fresh, imaginative and far-reaching overview of the Geometry of Spacetime. The DSEQEC fully resonates with the ER = EPR conjecture — providing the complementary geometry from the "ground floor" — if you will — on up. The very formation of ST must crucially contain the constraining parameters of the large scale Universe(s) from the get go. These were alluded to in TPISC III: Clarity and re-affirmed here, now, in TPISC IV: Details. DSEQEC — 1 from Reginald Brooks on Vimeo. DSEQEC — 2 from Reginald Brooks on Vimeo. DSEQEC-3 from Reginald Brooks on Vimeo. Note: The hypothetical photon is a model of my own making (see LightspeedST, LUFE) and has no experimental confirmation. Despite its highly visualized nature within the proposed quantum, pulse-propagating context in which it is described, it still remains just a model. The proposed connection between the two Left- and two Right-handed PPTs — as shown above — as the fundmental, underlying ST source of the phenomena of "spin", as depicted on the BIM, remains! It is this information as to the vector parameter of spin — magnitude and direction — that exists for each ST unit particle. Information that provides equal, yet opposite, spin vector direction simultaneoulsy. It is known, does not need to be transported, and becomes the in situ basis of entanglement. On the BIM (BBS-ISL Matrix), ALL Pythagorean Triples — parent, Primitive Pythagorean Triples (PPTs) and child, non-Primitive PTs (nPPTs) — are found. Because the BIM extends all Inverse Square Law (ISL) information to infinity, and, knowing any one matrix grid cell value and location, one (Nature) ubiquitously knows ALL the BIM values at ALL grid cell locations, and because the PTs, as part of the BIM, are also ubiquitously known, NO FASTER THAN LIGHT signal is required to extend the information to its ENTANGLED cohort particle regardless of the degree of space or time separation, i.e. SpaceTime (ST) separation. It is proposed in the DSEQEC that the PTs represent the quantum state values of spin, with the direction of travel of the spin vector that is measured being one of the sides of the PT. itself is bilaterally symmetrical, and, because every PT on the BIM is represented on a Row (or Column), and can be depicted in either “left-” or “right-“handed iterations, there are 4 total iterations of any given PT. Ones particular axial frame of reference when measuring the spin vector as up-down, left-right, + or -,…. ALWAYS results in the measurement reading of the opposite, but coherently entangled particle spin vector to be INSTANTLY equal but opposite precisely because the spin information is ALWAYS known. The movement in opposite direction ensures that, given the same axial frame of reference, the opposite will always be chosen. One may argue that the measurement is collapsing the wave-probability function in which both spin vector directions simultaneously exist and it is the act of measuring that collapses the wave function to select one or the other spin vector direction. And in one sense, that is true. But NOT in the sense that some hidden information traveling faster than light is then communicating, via a signal, to the other particle to register the opposite spin vector direction. NO. There are is NO hidden variable information and there is NO faster than light signal pushing information to the other entangled particle. What is happening is that the choice of measurement to utilize a specific and consistent axial frame of reference to register the spin vector angular momentum direction crucially pre-selects the COMPLETELY, SIMULTANEOUSLY KNOWN INFORMATION of the other entangled ST unit particle, giving the equal, but opposite spin vector direction when measured with the same axial frame of reference. The DSEQEC is consistent with and provides a complementary theoretical basis for the ER = EPR work of Leonard Susskind, Juan Maldacena and Mark Van Raamsdonk. The ER = EPR conjecture is a very interesting insight into the joining of quantum mechanics with quantum gravity through the geometry of spacetime. But what of the Double-Slit Experiment? The same KNOWN INFORMATION of the PTs on the BIM means that even a single ST unit particle — be it a photon or an electron — can interfere with itself in going through the two slits because the INFORMATION of BOTH possible paths is KNOWN from the start. Now, it is the process of detecting (measuring) which slit the ST particle went through that destroys the heretofor entangled INFORMATION, resulting in the loss of the interference pattern. A tip of the hat to Jacob Kafka’s “Rough Animator” app. The quantum universe begs the question: what is the quantum? Perhaps we can say the basic pulse-propagation of ST from its singularity — a singularity connected to the larger pool of all singularities by the Conservation of Energy — out into full spacetime extension, and back, is the fundamental quantum. The ST so formed has articulation points, nodes of structural formation made by the embedded Pythagorean Triples. These nodes are also quantized as they both are dependent upon the unfolding Inverse Square Law-based ST, and they have distinct vector parameters inherently built into their asymmetric forms. They have both magnitude and direction — and as vectors their net expression can be the result of the total added or subtracted interfering ST units. The fact that every primitive PT comes in both its parent PPT form as well as its child nPPT form provides a built in fractal-like structure, that, when combined with the fact that each and every PT — PPT and nPPT — has 4 iterations of expression within the unfolding ST unit pulse-propagation, and we we now have a fractal-based, holographic quantum universe(s)! The Conservation Laws, and specifically the Conservation of Energy — the Conservation of Lightspeed — the Conservation of SpaceTime — has been at the center of the discovery of the BIM. The ISL is at the heart of ST formation and its expression as matter and fields. At the “end of the day” it must be conserved! And while discovering how intimately and profoundly the Pythagorean Triples — especially in the form of the ToPPTs — are so incredibly Number Pattern Sequence inter-related to each other and their placement on the BIM — as also referred to as the BIMtree — is a giant step forward, it is its structural implications that give it meaning. The PTs give structural nodes and forms to the generalized BIM structure in the unfolding of ST.
As ST forms, i.e. expresses itself as, matter and waves, it must address the underlying imperative that in total, its Conservation Laws must be upheld. If the ST parameters that give identity to wave-particle forms of matter and/or to wave-particle forms of an energy field — parameters such as energy, momentum, charge, baryon number, and lepton number — are a manifestation of their underlying quantum number state, then these too must be intimately involved in the Conservation Laws. When a wave-particle ST unit seems to either separate into two parts that later recombine as they interfere with each other (Double-Slit Experiment), and/or, when they are part of a system of two (or more) ST units entangled (Quantum Entanglement) via sharing the same quantum number state, they BOTH MUST DO SO IN A WAY THAT SATISFIES THE CONSERVATION LAWS! The total angular spin momentum of any system must be such that it does NOT violate the Conservation Laws. Naturally, if the entangled ST units have spin measured UP on one axis of one of the entangled pairs, it MUST measure DOWN on the same axis of measurement on the other entangled unit. This is the Conservation Law in action. If the ST that informs the wave-particle and its parameters ALWAYS obeys the Conservation Laws, then the geometry that informs that ST formation must in and of itself ALWAYS obey the same laws. The BIM and BIMtree, being the geometry of the BIM and BIMtree expression,both simultaneously and automatically precede and inform any and all subsequent ST unit expression, and, that this geometry is ubiquitous — expanding to infinity! Such profound harmony of form naturally begs the question: to what effect? Would not the fractal-nodes of the PTs lead to structural articulation points along the expanding ST that would allow the geometry of the Squares to be enhanced by the embedded geometry of the non-Square Rectangles holding these PTs? Would not these same fractal-nodes of the PTs be internal, integral and identifying structural parameters (Quantum State Numbers) of any wave-particle ST unit formed? Would not the immensely inter-connecting linkage of the PTs, between the PTs and between the PTs and the BIM itself, provide the very basis of the wave-particle duality and entanglement phenomenon we see in the Double-Slit Experiment and the Quantum Entanglement (DSEQEConjecture) that lies at the core of our understanding the Quantum Universe? Form follows function — function follows Form! SEE Page 50 (Art Theory101: White Papers) for spreadsheets: BIM: How to Make. https://quantumfrontiers.com/tag/patrick-hayden/ Here’s one way to get out of a black hole! https://journals.aps.org/pr/abstract/10.1103/PhysRev.47.777 Can Quantum-Mechanical Description of Physical Reality Be Considered Complete? KEYWORDS TAGS: TPISC, The Pythagorean - Inverse Square Connections, Pythagorean Triangles, DNA, Zika virus, pentagon, decagon, double pentagon, composite axial DNA double-helix, Pythagorean Triples, primitive Pythagorean Triples, non-primitive Pythagorean Triples, Pythagorean Theorem, Pythagorus Theorem, The Dickson Method, BBS-ISL Matrix, Expanded Dickson Method, r-sets, s-set, t-sets, Pair-sets, geometric proofs, MathspeedST, leapfrogging LightspeedST FASTER than the speed of light, Brooks (Base) Square- Inverse Square Law (ISL), BBS-ISL Matrix grid, The Architecture Of SpaceTime (TAOST), The Conspicuous Absence Of Primes (TCAOP), A Fresh Piece Of Pi(e), AFPOP, Numbers of Inevitability, LightspeedST, Teachers, Educators and Students (TES), number theory, ubiquitous information, FASTER than the speed of light, primes, prime numbers, fractals, mathematics, Universe, cosmos, patterns in number, DSEQEC, Double-Slit Experiment-Quantum Entanglement Conjecture, CaCost, Creation and Conservation of SpaceTime. Copyright 2018, Reginald Brooks, Brooks Design. All rights reserved. iTunes, iTunes Store, iBooks, iBooks Store, iBooks Author, Mac OS are registered® trademarks of Apple Inc. and their use on this webpage does not reflect endorsement by Apple Inc.